This is a cool little viral to promote their product. Well done Dyson! Sorry this is a bit late, but great design and execution! 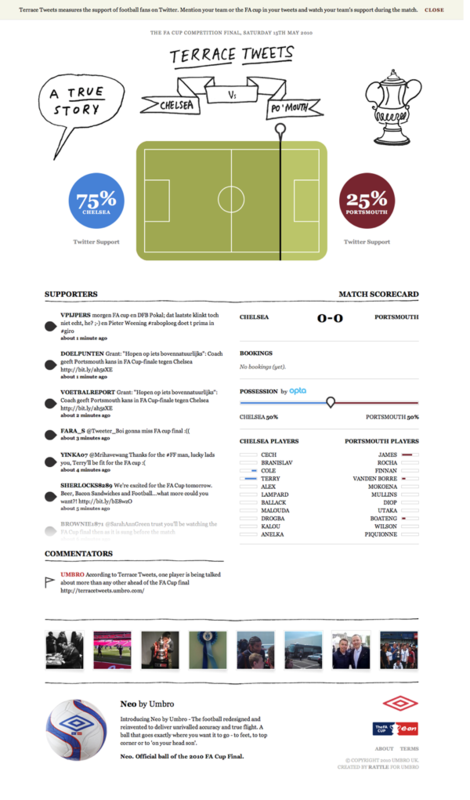 Terrace Tweets measures the support of football fans on Twitter. 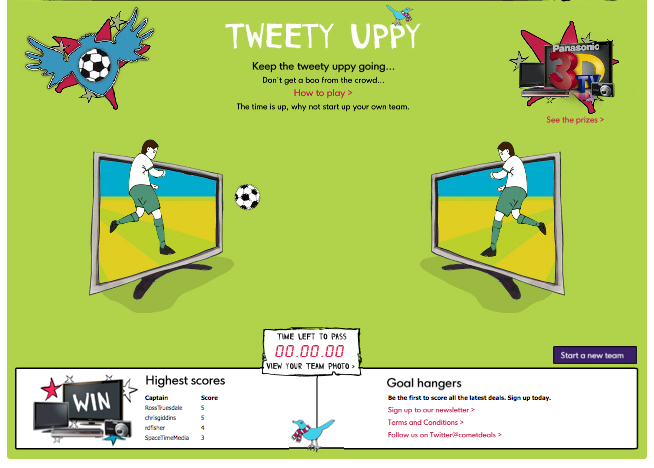 Mention your team or the FA cup in your tweets and watch your team’s support during the match. Terry Wogan introduces Puma Hardchorus’s very own version of the Eurovision Song Contest, complete with hooligan choirs form France, Germany, Italy and, of course, England. The must-see viral – expertly captured in a single take (like the honda cog example) – sees an ordinary football making a complex and dangerous journey past a number of landmarks. Very nice and good fun. I fancy Spain for the World Cup by the way! This is a cool little twitter based game by Comet. The idea is to compile a team of tweeters and kick the ‘ball’ between each other keep the tweety uppy going, otherwise you will receive a boo from the crowd. Teams have 2 hours to pass the ‘ball’ and keep the chain going. The longest chain wins, currently the longest chain is only 5. I am going to compile a team and try and win the 50” plasma, who’s with me?